The Infiniti 53 has been specifically designed to be a robust offshore-capable yacht with an ergonomic deck layout and interior. 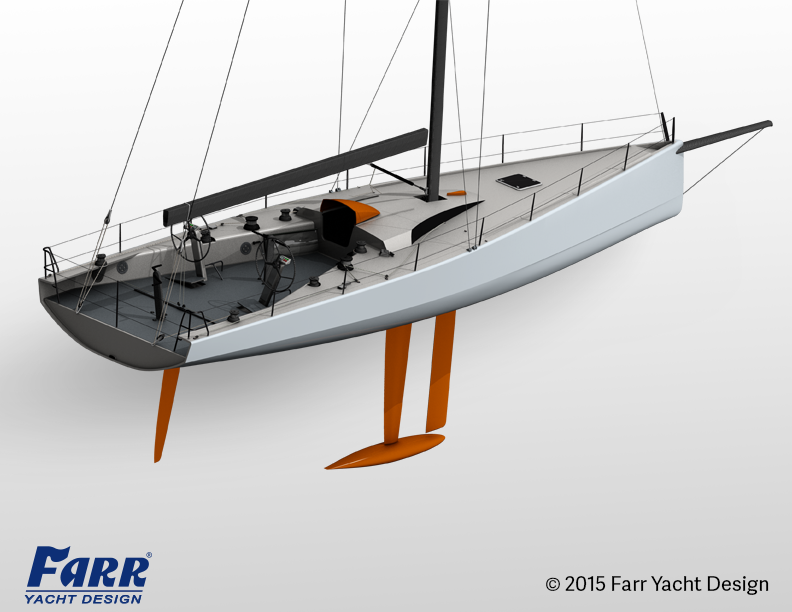 The yacht is a similar beam-to-draft ratio as a typical TP52. It is a balanced design capable of excellent performance in a wide range of conditions. A displacement of ~7300 kg is lighter for its length than a TP52. The construction specifications are not so aggressively light as to incur significant construction costs or impose dramatic rating penalties. 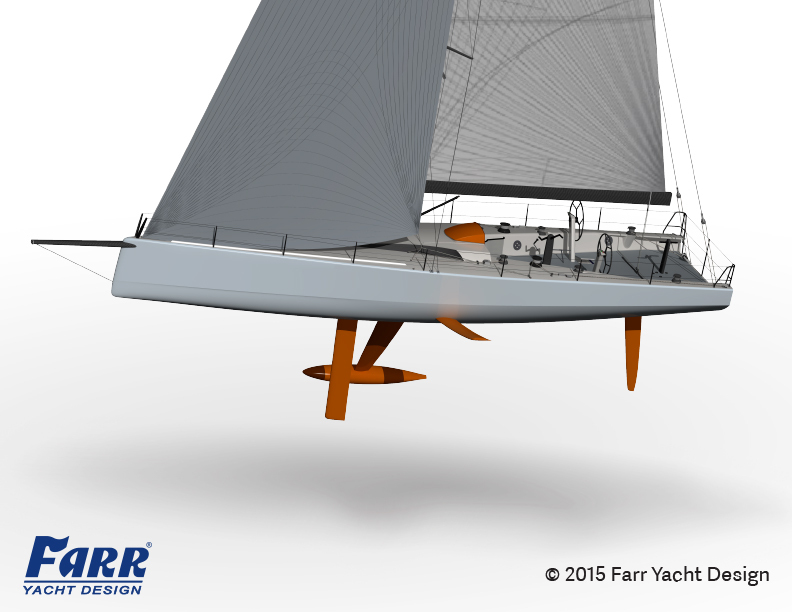 The hull form is a development of FYD’s extensive race projects and benefits from comprehensive CFD studies to deliver an optimized solution. The low drag form can be driven efficiently by a reasonable sailplan, even in light air, but has sufficient form stability and ballast ratio to achieve exceptional performance in moderate to strong breezes. As a light, high-speed yacht, the hull has a relatively high beam to draft and features a full length chine positioned to maximize high speed handling and form stability. Forward, the chine blends into fair strakes that act to peel the spray sheet off the yacht and provides dynamic bow lift at high speed. 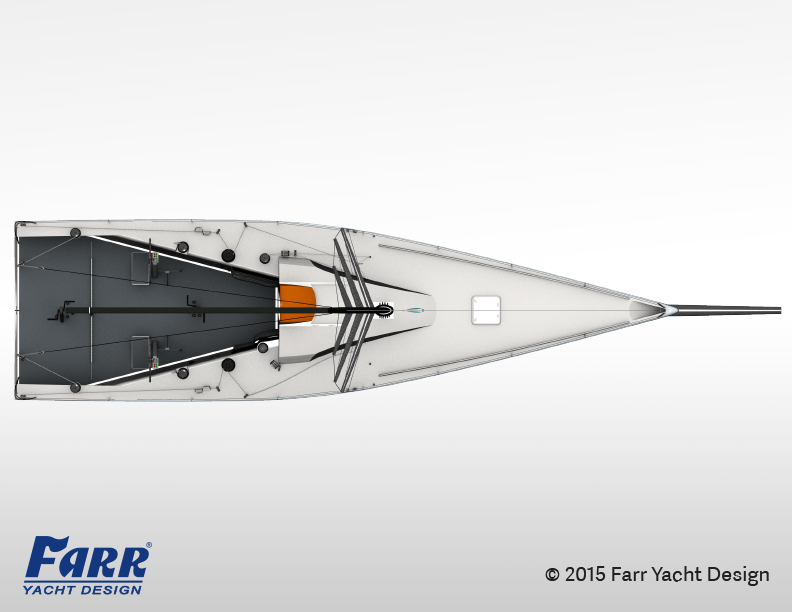 The hull shape maximizes its effective length relative to its rating without adding extra drag at low speeds. The hull shape utilizes a sophisticated and precise surface control that allows for a high level of control in developing both the heeled and upright shape. The yacht incorporates a high chine line that acts to increase high angle stability and serves to assist directional stability and transitional planning downwind and reaching. The deck beam is carried to the transom in order to maximize crew hiking moment when the crew shifts aft in strong winds, particularly when reaching and running. The hull incorporates a number of signature aesthetic features that give the yacht a unique character. The reverse stem and subtly reversed sheer line give the impression of forward speed even at rest and draw comparison to FYD’s other high level Grand Prix designs. The interior is a fully functional racing layout. The lightweight galley is just forward of the companionway, and designed to be used underway. The partially enclosed head is located just forward of the galley, beyond the mast bulkhead. Under the cockpit there is a dedicated navigation station, which rotates about the centreline to allow the navigator to always sit to windward. There are five pipe berths on either side of the yacht to allow the off watch to distribute their weight effectively. 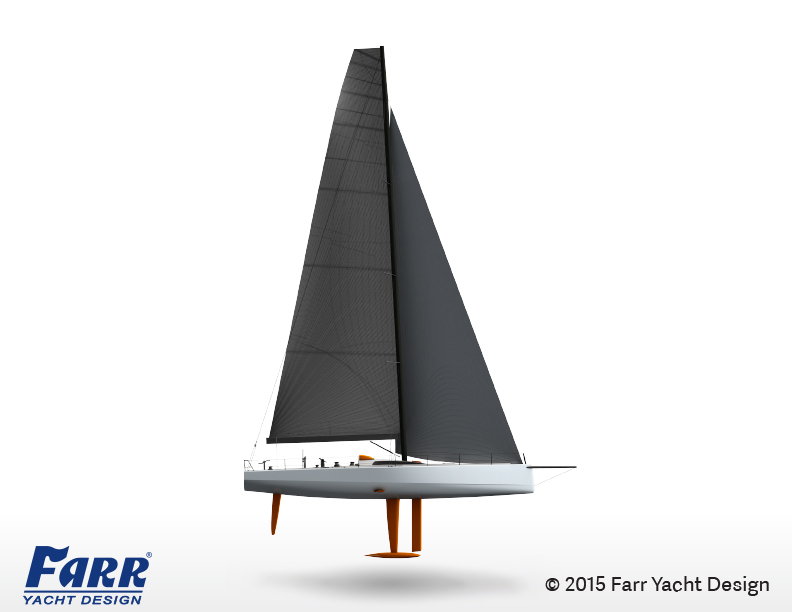 The yacht is designed to perform exceptionally well in IRC offshore races. The deck geometry includes a low aspect, chiselled house designed to deflect green water. The deck layout is a modern, Grand Prix arrangement designed to allow ergonomically optimized access to all sail controls. Twin driven Harken pedestals, one placed aft of the traveller, are used to power the mainsheet and primary winches as well as one of the pit winches. The winch package features carbon fibre Harken 65s all around, except for the primary winches, which are carbon fibre Harken 990s. The hardware arrangement offers a large amount of flexibility that is very useful during sail handling manoeuvres. In addition to being able to power any of the driven winches, the aft pedestal also drives a rotary pump to power the sailing hydraulics. This pump can also serve as a backup power source for canting the keel. The use of hydraulics for certain sailing functions reduces the amount of line in the cockpit and allows for very precise and easy adjustment. The underlying concept behind the Infiniti 53 is to improve upon the highly successful canting keel Cookson 50 (design 541). Since its introduction in 2003, the Cookson 50 has been an unbeatable combination of value and performance. It has won or podium placed at every major offshore event worldwide. Performance improvements over the past 12 years, along with advances in structural engineering and composite construction techniques, have inspired this design. A very low drag hull form has been developed for the Infiniti 53. It can be driven efficiently by a reasonable sailplan even in light air but has the right balance of static stability from the hullform and deep center of gravity canting keel, combined with dynamic stability from the foil to give the boat unmatched performance in moderate to strong breezes. As a light, high speed boat the hull has a relatively high beam-to-draft and features a full length chine positioned to maximize high speed handling and form stability. The structure is engineered primarily using carbon and foam cores and is optimized to consider the efficient use of materials. One of the modern features on the Infiniti 53 will be DSS — a retractable foil that is deployed to leeward on the yacht. This foil creates lift to leeward, thereby increasing righting moment in a similar fashion to adding lead to the keel bulb or crew on the rail. 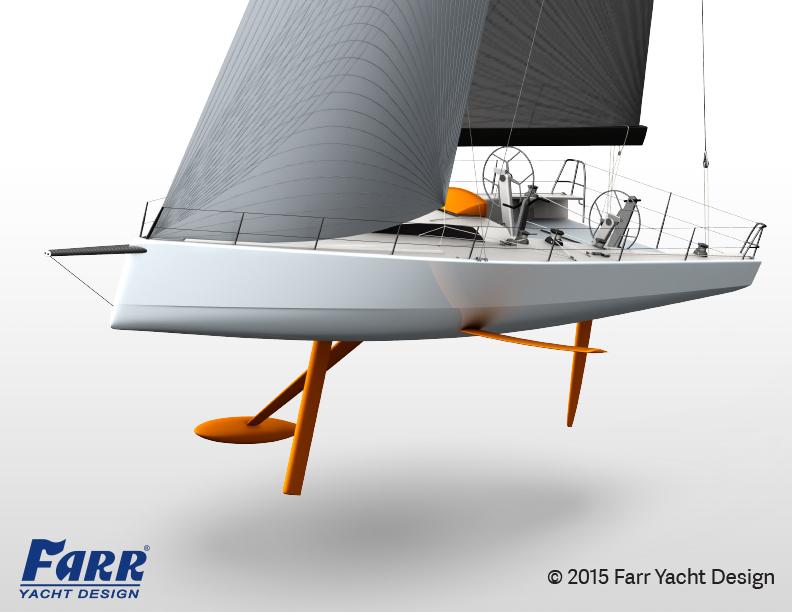 The technology was created by British yacht designer Hugh Welbourn and has been in development for more than a decade. DSS improves the yacht’s all-round performance by being “dynamic,” varying its effect depending on the boat’s speed. The stronger the wind, the faster the yacht and its DSS foil travel through the water, the more lift and stability the foil generates. Conversely, in light conditions, the foil is simply retracted, leaving an easily-driven hull shape. DSS delivers a yacht that has an exceptionally balanced performance profile across the entire wind range.